Coxmoor Golf Club, an accredited England Golf Championship venue, is in its fourth year of a major ten year redevelopment, working closely with architects, Creative Golf Design. The progressive Nottinghamshire club has an innovative programme of bunker and tee improvements to future proof the course which are already elevating its stature. Running alongside is a ten year woodlands plan in partnership with The Sherwood Forest Trust and the Forestry Commission. The goal is to restore the Sutton-in-Ashfield club to its natural heathland habitat with a better understanding of woodland management. Over 1500 trees have been thinned out making way for the best indigenous species, the focus on selecting trees across a spectrum of life cycle stages. By necessity, Course Manager, Ben Cumberland and his greenkeeping team of seven, adopt very effective solutions for removing leaf debris. Central to their operation is a previously under-used John Deere 3730 tractor, which now supports a Wiedenmann Whisper Twister blower on the front and a variety of equipment on the back. “When I joined Coxmoor, the 3730 tractor was a couple of years old with its three point front linkage kit untouched and no obvious plans to put it to use. With front linkage in place it made sense to attach a blower which could stay on for two to three months at a time,” explained Ben Cumberland. “James Robson from dealer Henton and Chatell got on the case and brought the Whisper Twister for demo and we kept it. “It’s fortunate the John Deere has low ground pressure and Galaxy flotation tyres so it can be over the greens for most of the year, leaving no imprint whatsoever. 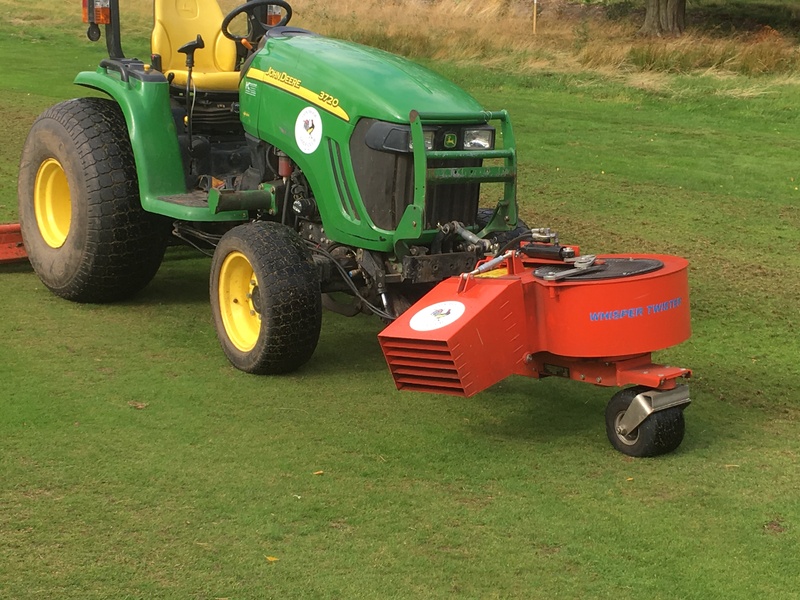 The Whisper Twister balances on a low pressure wheel so together they are perfect for fine turf. When it’s dry, the blower goes round the greens that need it in the morning to tidy them. We drive right up to a bunker, point the nozzle, rotate if required and the leaves are taken out easily. Because the driver’s view is to the front, you see everything; no awkward neck twisting trying to look behind,” continued Ben Cumberland.